Quantity: 10 available Want more than 10? Each $42 box contains 16 packs. Each pack contains 7 cards. Cardfight Vanguard: Strongest! Team AL4 features the 4 clans used by Asteroid's strongest members, Team AL4! This set can strengthen Ren Suzugamri Trial Decks (Shadow Paladin). Dark Irregulars, Pale Moon, and Murakumo decks can be constructed with just this booster! Each booster box contains 16 packs. Each pack includes 7 random cards, 2 of which are Rare or better. 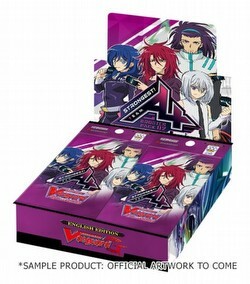 Each box also includes a pack of Gift Markers (1 each for Force, Accel, and Protect - one being a unit illust version). Gift Markers with hot-stamped signatures of the cast from the animation are featured as Secret Rares too. There are 84 cards (all new) in the set - 4 VR, 8 RRR, 12 RR, 17 R, and 43 C, plus 4 SVR Parallels, 4 OR Parallels, 1 Image Ride Rare Parallel, and 4 Secret Rares.